For the second time in a year, British voters delivered a wholly unexpected verdict that upended the established wisdom about British politics and sent shock waves around the world. On 23 June 2016, a majority went to the polls to cast a ballot to leave the European Union – “Brexit.” That led to the downfall of Conservative (Tory) prime minister David Cameron, who called the referendum anticipating a big vote to “remain.” The Brexit vote set off panic in certain capitalist circles, particularly among the bankers of the City of London, who have built their speculative empires as the financial linchpin of the EU. This past June 8, a “snap election” called by Cameron’s successor, Conservative prime minister Theresa May, hoping to solidify her support in the House of Commons, instead led to the loss of the Tory parliamentary majority and a huge increase for the opposition Labour Party. Prior to the vote, it was a near-universal belief among the political establishment and pundits of the bourgeois press that Labour leader Jeremy Corbyn was “unelectable” because of his mildly leftist politics. Instead, Labour went from 26% in the opinion polls at the start of the campaign to 40% at the ballot box, only slightly behind the Conservatives’ 42%. Then, only days after the vote, came the monstrous fire at Grenfell Tower that killed at least 79 people. This crystallized the mounting fury at the Tories and their policies of deregulation, privatization and utter disdain for the lives of poor and working people. The blaze was the result of cheap appliances provided in council flats (public housing) and cheap flammable exterior cladding that turned the high-rise building into a death trap, all to save the local housing authority, in the richest borough in the country, £300,000 (a little under $400,000). 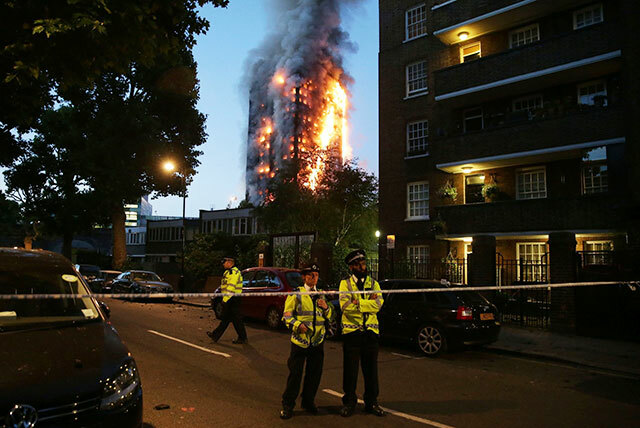 Six hundred high rises across Britain have the same deadly shell, and so far every one has failed a fire safety test. This corporate murder could bring the government down. This was a death foretold – the tenants’ organization Grenfell Action Group repeatedly warned against just such a catastrophic fire. Meanwhile North Kensington is full of unoccupied luxury buildings and apartments held as investments. Rather than let the survivors be exiled far outside of London, a mass working-class based mobilization to immediately rehouse them in such vacant properties is on the order of the day. At present, May’s occupancy of the prime minister’s residence at 10 Downing Street hangs by a thread, dependent on a shaky alliance with Northern Ireland’s Democratic Unionist Party (DUP), an ultra-reactionary, Protestant sectarian, homophobic party opposed to women’s right to abortion. With the loss of even a handful of votes threatening the government’s majority, before long they may be wheeling in ailing Tory Members of Parliament (MPs) on hospital gurneys to vote. Should there be a “hung Parliament,” with no party or coalition having a majority, a new election could well put Jeremy Corbyn in No. 10. Beyond Corbyn’s appeal as a rare case of a fairly honest politician, Labour owes its stunning advance – the largest since 1945 – to its election Manifesto which called for investing in the National Health Service, abolishing tuition for university students, some renationalizations and for an end to “Tory austerity.” This struck a chord particularly among youth (one million young voters registered during the campaign), who voted 2-to-1 (66%) for Labour, and among working-class voters in hard-hit industrial areas. But despite the euphoria of the reformist left, the manifesto is not a bit radical, and the hard fact is that Labour will not and cannot end anti-worker austerity. Almost the entire left in Britain, inside and outside of the Labour Party, portray the enemy as “neoliberalism,” namely the policies of “free trade,” cutbacks and privatization of state services, driving down wages and destruction of trade unions. This was carried out over the last three and a half decades, starting with the Tory “Iron Lady” Margaret Thatcher and continuing under both Conservative (John Major, David Cameron) and “New Labour” (Tony Blair, Gordon Brown) prime ministers. But there will be no return to the social-democratic capitalist “welfare state” of yore, for “neoliberalism” is not a policy to be adopted or discarded depending on vote totals, but the vicious expression of bankrupt capitalism in its epoch of imperialist decay. Behind the double miscalculation by Conservative leaders (and virtually the entire political elite) is a blindness to the harsh economic and political realities facing working people, young people and much of the middle class in Britain. Believing their own propaganda and phony government statistics that the British economy was on the mend since the 2007-08 financial crash, the high and mighty ignored the continued mass unemployment and increased poverty in the ongoing capitalist depression. Last year, economic discontent was diverted into the narrow English nationalism of the Brexiteers and the anti-immigrant racism that dominated both sides in the referendum. This year it fueled the huge increase in the Labour vote. The discontent is based on reality. From 2008 to 2015, while the gross domestic product rose by 2% a year, real wages for British workers fell by 1% a year. Of the G7 leading capitalist countries, Britain was the only one in which pay packets actually declined. Of the 34 advanced capitalist countries in the OECD (Organization of Economic Cooperation and Development), the only one that did worse than Britain in terms of real wages was Greece (“Falling real wages show the British economy is still struggling,” Guardian, 7 May). A report of the Social Mobility Commission says that Britain is increasingly divided between “haves and have-nots.” What’s happening is a revolt of the have-nots, but Labour’s call for a return to the welfare state is dead on arrival. The situation is particularly acute for young workers, whose unemployment rate is three times the national average (officially 12% for ages 18 to 24, in reality far higher). Meanwhile, the “labor market flexibility” touted by the neoliberal capitalist ideologues means that young workers are consigned to part-time and precarious jobs. Millions of young people in Britain have “zero hours contracts,” meaning that they are “on call” with no job stability whatsoever. It is this economic disaster for youth that gave rise in 2011 to the “Arab Spring” revolts in North Africa, to the indignados who occupied city squares in southern Europe and to Occupy Wall Street in the United States. Their cry was one of desperation, and their movements short-lived. This is what led young people to eagerly vote for Tsipras and SYRIZA in Greece in 2015, only to be bitterly disappointed when he inevitably capitulated to the Brussels bankers. Last year youth in the United States likewise flocked to rallies for Bernie Sanders in the United States, and then despaired when this liberal Democrat who calls himself a “democratic socialist” inevitably endorsed Wall Street’s candidate, Hillary Clinton. 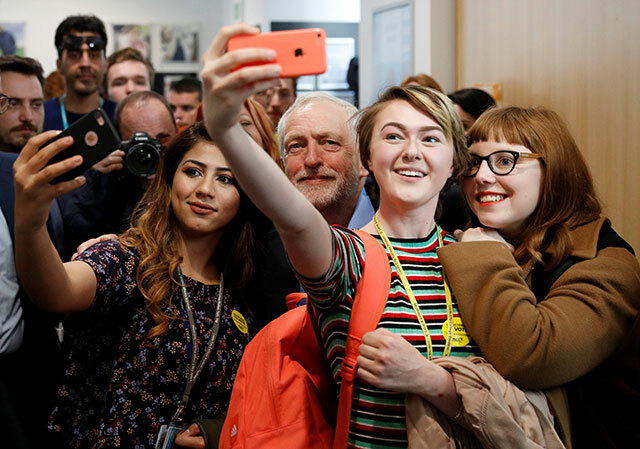 In Britain, the enthusiastic youth vote won Jeremy Corbyn the Labour leadership and then confounded the pollsters and politicians with a huge turnout on June 8. Tsipras and Sanders are populist bourgeois politicians, while Corbyn is a Labour reformist. But their common program of a return to “welfare state” capitalism is doomed to fail. The Conservatives thought that they could pummel Labour in the election (and maybe destroy it as a party) by stepping up their virulent immigrant-bashing, and pushing for a “hard Brexit.” But Corbyn headed off an attack from the anti-immigrant right by joining them, declaring in Labour’s election Manifesto that “freedom of movement will end when we leave the European Union.” Meanwhile, he instructed Labour MPs to vote for May’s bill to trigger Brexit without conditions. And by talking in the campaign of staying in the European single market (“soft Brexit”), he attracted votes from youth who were getting worried that they might be stuck in an insular Britain. Some were also frightened by May’s embrace of Donald Trump. When Labour’s Manifesto was leaked to the press in early May, the leakers figured it would be universally condemned as hopelessly radical and help them topple Corbyn as Labour leader after a crushing defeat at the polls. Pundits declared it the most left-wing manifesto since Labour’s 1983 platform, recalling the description of that document by a right-wing Labour MP as “the longest suicide note in history.” But instead of universal condemnation, the opposite occurred. Youth heard it was radical and even “socialist,” and rushed to register to vote and join Labour. But the reality of the Manifesto is very different from the hype. Even the title, “For the Many, Not the Few,” was taken from Tony Blair’s 1997 “New Labour” election campaign. In fact, key clauses of the 2017 Manifesto were imposed by the right wing of Labour. Michael Foot’s 1983 Labour Manifesto called for unilateral nuclear disarmament. It didn’t mean it, of course, as it continued to call for a “strong” defense, was committed to the NATO imperialist military alliance and strongly supported the anti-Soviet Cold War drive. The 2017 Manifesto, in contrast, declares that “Labour supports the renewal of the Trident submarine system” and that “Conservative spending cuts have put Britain’s security at risk.” It vowed to increase “defense” spending to 2% of the gross domestic product, as Donald Trump and his predecessors in Washington have long demanded. Nothing even vaguely “anti-capitalist,” much less “socialist,” about it, this is the program of an emphatically pro-imperialist party. Under Corbyn, Labour continues to fulfill its role as “Her Majesty’s Loyal Opposition,” pledging fealty to the military and police, the central organs of the capitalist state. For the rest of the election platform, it promises very small reforms indeed. Corbyn calls for spending more on the National Health Service, which the Conservatives in power are running into the ground. The Manifesto talks of a “Public Ownership of the Railways” bill, but in the concrete it proposes “bringing our railways back into public ownership, as franchises expire.” Some of those franchises don’t expire until 2030! Even sectors of the bourgeoisie could back this, given the impending disaster in the NHS and the abysmal safety record of the privatized railways. Corbyn’s leadership of Labour has awakened hopes, particularly among young people who have known nothing but “neoliberal” austerity all their lives. But those hopes are for a gradual, very gradual, return by baby steps to the welfare state of yore. Yet that is impossible, it is fool’s gold. The City bankers will not tolerate that any more that the Brussels bureaucrats and Frankfurt bankers would, because the entire financial system is bankrupt and they have to extort massive profits from the working class and slash state expenditures to survive the coming meltdown. Awakening illusions in a return to the (capitalist) welfare state will not lead to heightened class struggle but rather serve as an obstacle to it. With Labour’s election platform there was no reason for class-conscious workers to vote for this militarist, pro-police party. It was standard social-democratic fare, which only seems leftist when compared with Tony Blair’s New Labour treachery. The most concrete and consequential of the proposed reforms, abolition of university tuition fees and the reintroduction of maintenance grants for students, could be the focus of a big struggle. Getting rid of a raft of Tory anti-union laws could be another key battlefield. Yet these battles won’t be won in Parliament, but through mobilizing the power of the working class, including against opposition from a Labour cabinet and back benches, where anti-Corbyn right-wingers still have a huge majority. Not so long ago, impressionistic leftists wrote off Labour under Blair as just another bourgeois party. All it took was a change of the Leader to send these wayward Labourites scurrying home. Despite the exclusions enforced by chief witch hunter Tom Watson, an opportunist hodgepodge of the Labour Representation Committee, Labour Party Marxists, Red Flag, Socialist Fight and assorted other Labour lefts looked to the Momentum movement, set up to further Corbyn’s fight for the party leadership. Since Momentum leader John Lansman and Corbyn’s right-hand man John McDonnell decided to purge “the sectarian left” and “Trots” (including the Shachtmanite Alliance for Workers Liberty), the opportunists have now migrated to Grassroots Momentum. Almost the entire British left called to vote for Labour. But who were they voting for? The party machinery starting at the top is still controlled by the right wing. As for the Parliamentary Labour Party, which sets its own policy irrespective of party conferences, branch meetings and the like, a pre-election tally by the New Statesman (4 May) came up with 33 pro-Corbyn MPs. A post-June 8 head count by Labour Party Marxists added 13 more Corbynistas among the new backbenchers, giving a total of 46 out of 262, a little under one in six. The most virulent right-wingers declared in the campaign that they would “never” vote for Corbyn as prime minister. Now they are begging to be included in the shadow cabinet. This is the party the left voted for. By the next year, the “critical” veneer had disappeared altogether. In the face of the attempt by Labour right-wingers to unseat him, the SL/B newspaper, Workers Hammer (Autumn 2016), had the front-page headline, “Let Jeremy Corbyn Run the Labour Party.” In the body of the article it proclaimed: “Jeremy Corbyn must be allowed to run the Labour Party, in his own way” (emphasis in original). This was not “critical support,” as Lenin talked of giving electoral support to Labour in some circumstances “as a rope supports a hanged man.” This was full-throated political support to the leadership of the reformist Labour Party. The SL/B declared there was a “class difference” between Corbyn and his Blairite challenger Owen Smith, because Corbyn (who campaigned for Remain) pledged to honor the vote for Brexit, while Smith continued to oppose it. The gyrations continue. The Spring 2017 issue of Workers Hammer has a front-page headline, “Shame on Corbyn for Supporting the EU.” The article contains a partial “correction.” It turns out “there is no class difference between Smith and Corbyn over the EU” after all. “Corbyn betrayed when it mattered by crossing the class line and serving the bourgeoisie in campaigning for the EU…. By covering for Corbyn’s betrayal on the EU, we helped to reinforce illusions in a Corbyn-led Labour Party.” But it says this was “counter to the otherwise correct thrust of our propaganda” of defending Corbyn against the Blairite agents of the bourgeoisie. Aside from the bizarre scolding tone, all this puts the SL/B and the ICL in a pretty pickle. If the policy is correct, then what about “Jeremy Corbyn must be allowed to run the Labour Party, in his own way”? That seems to be exactly what he has done. But there is no self-criticism about that fulsome political support for the reformist leader of a reformist party. In a May 27 statement on the British elections, “No Vote to the Labour Party!” the SL/B writes: “The central issue in the 8 June general election is Brexit – and Labour’s position on the EU is contrary to the interests of the working class.” But if by the ICL’s twisted logic the class line is between pro- and anti-Brexit, then mirabile dictu! hard-Brexiteer Theresa May must be fighting for the workers while soft-Brexiteer Corbyn is supporting the bourgeoisie! For decades, various ostensibly Trotskyist tendencies in Britain have pushed to “make the Labour lefts fight.” But as Trotsky warned at the time of the British General Strike of 1926, it was the Labour lefts who were the biggest betrayers and the biggest obstacle to revolution. The once-Trotskyist International Communist League has lately been gyrating like a top on just about every hotly disputed issue. This has led it into the embrace of the most retrograde British nationalism, the very antithesis of the proletarian internationalism of the Bolsheviks. Who can imagine Lenin and Trotsky declaring that the class line runs down the English channel? Genuine Trotskyists, in contrast, have remained consistent with our revolutionary program. The League for the Fourth International opposed Corbyn when he campaigned to remain in the EU, and we oppose him now when he calls to implement Brexit. We oppose the NATO imperialist military alliance, which Corbyn’s Labour Party supports. We called in September 2014 “For a Scottish Workers Republic in a Socialist Federation of the British Isles” (The Internationalist No. 40, Summer 2015) while Corbyn opposes Scottish independence and even promises to “tirelessly campaign” against a second referendum on independence. 2. See “Fury of Student Revolt Shakes Up Britain,” The Internationalist No. 32, January-February 2011. 3. See “Her Majesty’s Social Democrats in Bed with the Police,” The Internationalist No. 29, Summer 2009.